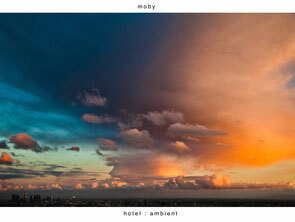 On 16 December, Moby will re-release ‘Hotel: Ambient', the long out-of-print, limited edition companion disc to the 2005 album, ‘Hotel’, in a remastered version, with the original tracklist filled out with previously unreleased tracks. In conjunction, Moby will also present his first-ever live performances devoted to his ambient material. The first performance will take place on the release at the Masonic Lodge in Los Angles, CA. ‘Hotel: Ambient’ was originally released as a very limited bonus disc to the ‘Hotel’ album, and is some of the best music Moby has ever created and was (almost) lost to history. The album in many ways sums up Moby’s roots; highlighting the link between Philip Glass, Steve Reich and Brian Eno and the dance music of, say, groundbreaking Detroit techno from Derrick May and experimental IDM from early Warp releases. Moby: "I first heard, and heard about, ambient music on the b-side of David Bowie's 'heroes'. As much as I’ve loved writing songs and dance tracks I’ve always been obsessed with the ways in which ambient and instrumental music can transform the space in which their being listened. i also really appreciate the subtle and at times un-demanding qualities of ambient music, and the ways in which it can unconventionally reach people emotionally."